Non-invasive optical temperature sensing is essential for remote monitoring of fabrication processes, in situations where the sample needs to be insulated from the environment, at extreme or rapidly changing temperatures, and in the presence of strong and varying magnetic fields. Optical temperature sensors measure frequency shifts of optical resonances and often require long optical paths to compensate for very small thermo-optical coefficients of materials. However, a phase of light is a cyclic variable, which is undefined at the point of complete destructive interference, and varies rapidly in the vicinity of this point. For example, a phase shift of the plane wave reflected from a planar interface exhibits singular behavior at frequencies where the surface reflectance vanishes. Narrow asymmetric spectral features in the sensor phase response near such singular points are very sensitive to any environmental changes and can be used to improve the sensitivity of remote sensors with optical transduction. Plasmonic metasurfaces can be designed to achieve the singular-phase condition, yet this typically requires complex electromagnetic design and low-throughput fabrication techniques such as electron beam lithography. In a new work, an international team led by an MIT researcher Dr. Svetlana Boriskina developed a simple and robust planar singular-phase sensing platform for remote temperature detection, which does not require nano-patterning and exhibits singular-phase behavior due to the excitation of topologically protected Tamm surface states. The researchers engineered Tamm states on planar material interfaces between metal and dielectric thin films by using the boundary-bulk correspondence principle adopted from the physics of topological materials and the conjugate impedance matching approach borrowed from the antenna theory. They demonstrated singular-phase temperature detection with an over an order of magnitude improvement in sensor sensitivity and over two orders of magnitude improvement in the figure of merit over the standard approach of measuring shifts of resonant features in the reflectance spectra of the same sensor. Planar structures that support Tamm interfacial states can be fabricated by using a variety of materials, including those compatible with standard complementary metal oxide semiconductor (CMOS) technologies. The resonant wavelengths of Tamm sensors are highly tunable, and do not directly depend on the plasma frequency of the absorber material. The sensors are amenable to fast and large-scale fabrication by either sputtering of vapor deposition techniques. Unlike nano-patterned plasmonic sensors, planar Tamm detectors can be used in harsh environmental conditions, including corrosive atmosphere and high temperatures, which can cause severe degradation of nanostructured surface texture. Although the developed Tamm absorbers were only characterized as temperature sensors, they offer a simple, sensitive and tunable platform for a wide variety of sensing applications including monitoring surface bio/chemical binding events and environmental sensing. 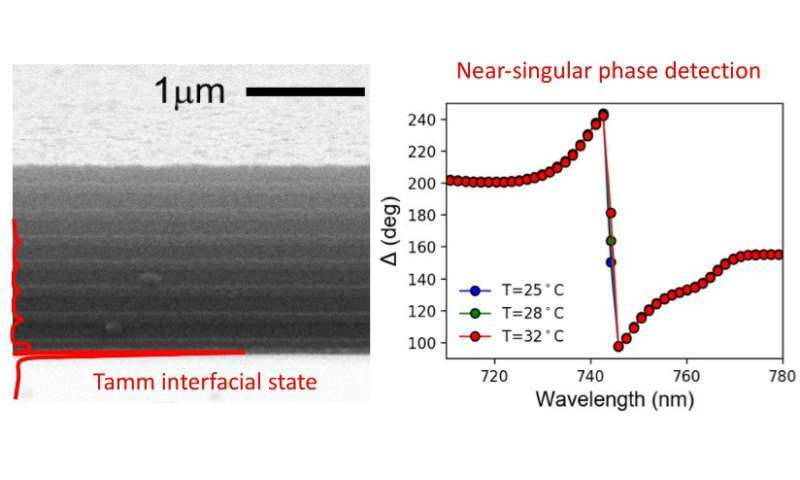 The results of this work are reported in the ACS Photonics paper "Topological engineering of interfacial optical Tamm states for highly sensitive near-singular-phase optical detection."